Our goal is to help newcomers to see their dream of making Canada their home. 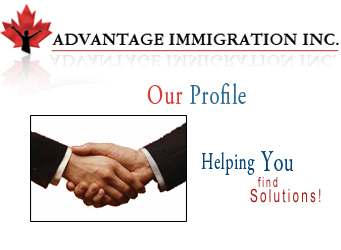 Advantage Immigration Inc. was established in response to the need for support for newcomers to Canada in the Central Alberta Region. Since our initial start we have grown to serve employers and employees all over Alberta including Edmonton, Calgary and some regions of Northern Alberta. We provide services to assist employers with their questions about hiring foreign workers as well as assist employees with every aspect leading to Permanent Residence. We maintain standards that are consistent with the Code of Conduct for Immigration Consultants through CSIC and offer quality, courteous and effective consulting for our clients. We have a combined strength in technology resources, which we use to effectively manage applications and follow-up as well as assist employers with their follow-up needs. If you have questions about coming to Canada, please e-mail us!